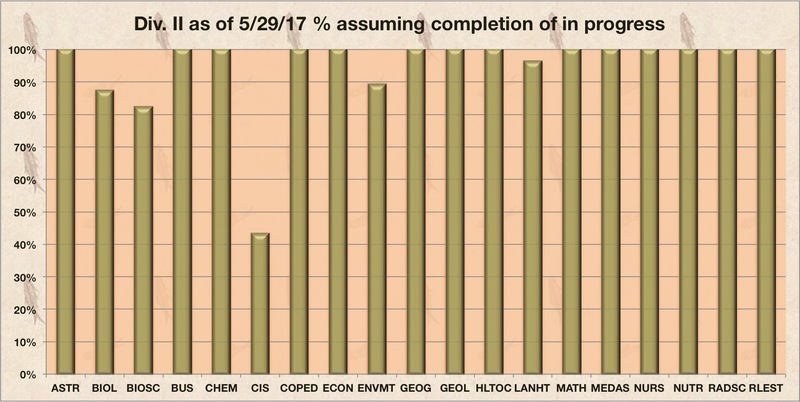 As of June 1, 2017, we are 96% on track towards our goal of ensuring that all courses offered in spring 2017 have been assessed within the three-year cycle. To reach our goal all faculty must complete their assessments. Completion = evaluation of and reflection upon findings, and then developing a plan of action if changes are to be considered. 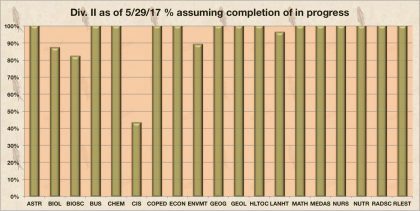 The below charts indicate the percentage each discipline has achieved, assuming completion of all assessments currently in progress. 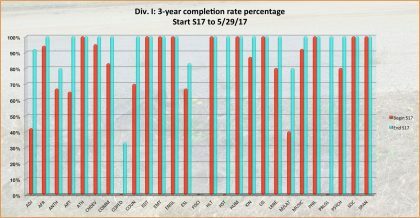 These percentages reflect completion rates only for courses offered this spring. For departmental assessment achievement rates of ALL courses offered within the 3-year period, scroll down. We are on a 3-year assessment cycle and this cycle includes ALL courses offered within that period. The red bars in the charts below indicate that department’s percentage before our current assessment push. 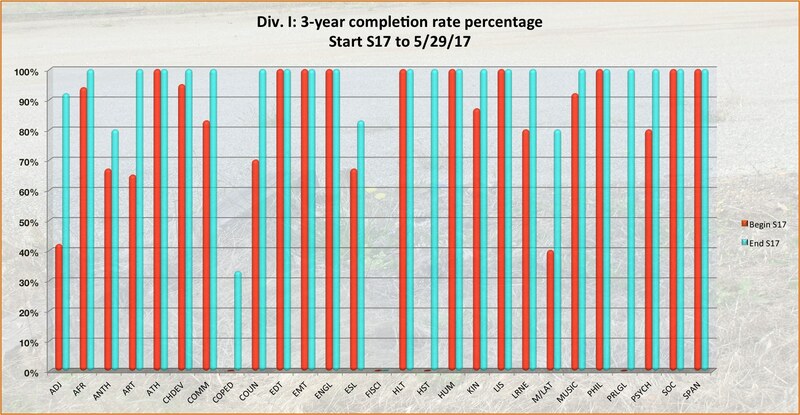 Blue bars shows the department’s completion rate as of now, June 1, 2017. Some courses within the 3-year period may have been offered only once, for example. In those cases where a course was not assessed the last time they were offered, our goal is to ensure those courses will be assessed next offering. Beyond course Student Learning Outcomes (SLOs) assessments, departments engage in dialogue and assess the effectiveness in achieving Program Learning Outcomes (PLOs). 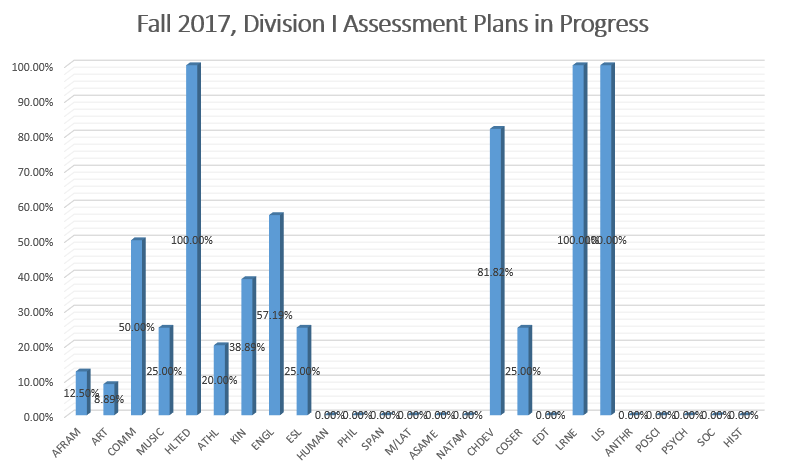 We are currently updating PLO assessment completion rates, and those numbers will be available soon. Flex day Power Point presentation by Heather Casale, Merritt College’s SLOAC chair. Click here to view Power Point presentation.